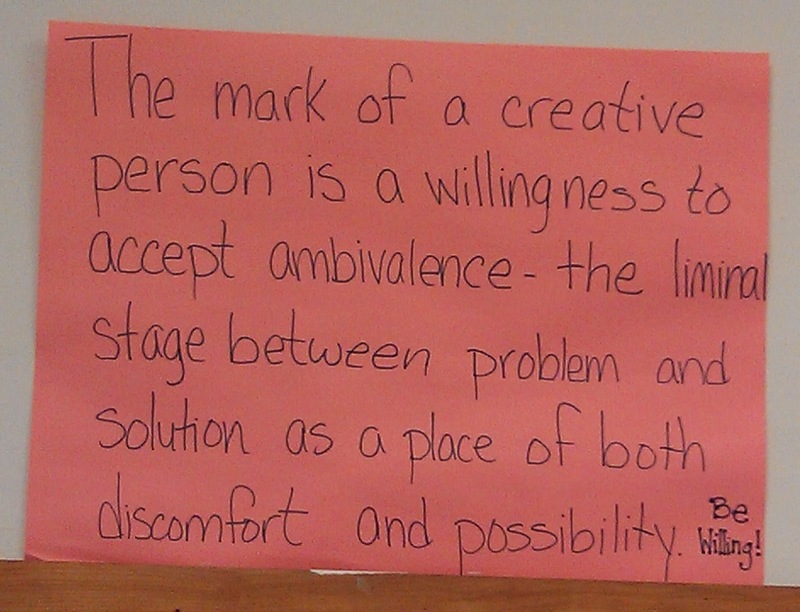 and solution as a place of both discomfort and possibility. The quote intrigued me, partly because it evidences a degree of ambition on the part of the English teacher, but also just because. So, I tried to track it down, and located it in an article on Whole Living. 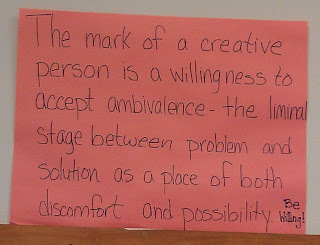 "The mark of a creative person, according to Briggs, is a willingness to accept ambivalence -- that liminal stage between problem and solution -- as a place of both discomfort and possibility." And so, one thing led to another, and I've just finished reading a book by John Briggs and F. David Peat called Seven Life Lessons of Chaos - which I quite liked, so much so that I filled up the library copy with post-its, and may need to get my own copy. Chaos is everywhere. Order tends towards it, entropy. And yet, "thousands of tiny interconnections hold the system in place". I behave one way, it affects you. And vice versa. And when we all keep to the right on the subway staircases, we all get where we're going faster. Beauty is often alive with chaos: "Like healthy heartbeats, the rhythmic intervals in such music are always slightly irregular...fractal fluctuation within regularity...brings the music alive." Rivers and coastlines evidence organized chaos, where "apparent disorder masks an underlying pattern." I found myself thinking about my town too, a town that is consumed with agita over two significant potential projects, with angry people on all sides of the arguments. What it needs is a way to "suspend their polarities and non-negotiable convictions long enough for something new to emerge". Rather than ending this book with a summing up, some definitive statement about life and chaos theory, perhaps we should be simply asking a question. What question shall we ask? I always think we should ask a question that defuses the situation--any question to which the answer is 42. I need a "like" button for not only your post but for Jeanne's excellent comment. I think what people fear is not change but what they imagine the future to be like after the change occurs. So to my mind, the trick to breaking gridlock is in clearly stating those feared futures, then letting them go -- with the faith that by working together honestly, a better vision can emerge. Regarding that quote about limit-cycle systems: I'd say a lot of energy is devoted to avoiding a future people imagine will be bad, rather than having both the confidence and the faith that by working together, a better future vision (not a compromise but a new vision) will emerge. Creativity requires a great deal of confidence and faith, I think. This is timely for me. I gave a lecture today about learning being messy. I also threw in that I was teaching them to fish not giving them fish. Such unwillingness to sit with uncertainty if they are doing it "right!" for any length of time. It's quite sad.